The NYC Parks Department has scheduled qualifying tests to become a lifeguard for the 2016 summer season. The test is being held at Chelsea Recreation Center in Manhattan from December 7 through January 8, on Monday, Wednesday, and Friday at 4:30 pm and 6:30 pm, and is also underway at pools throughout the five boroughs. 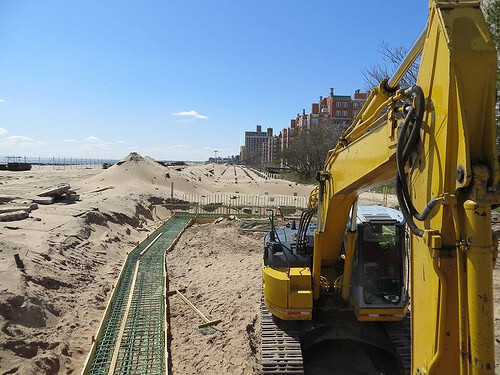 A Parks spokesman tells ATZ that assignments are by seniority, but lifeguards may request a preferred or convenient location such as Coney Island or Brighton Beach. Beach lifeguards must be able to swim 440 yards in 6 minutes and 40 seconds and must also complete a 300-yard ocean swim prior to receiving their assignment. •	Be at least 16 years of age by the start of employment (the end of June). •	Have at least 20/30 vision in one eye and 20/40 in the other – without corrective lenses. Glasses and contact lenses may not be worn during the eye exam. •	Be able to swim 50 yards in 35 seconds or less, with proper form. Swimmers who pass the test will be enrolled in the Municipal Lifeguard Training Program, which is free, and consists of 40 hours of swimming and rescue techniques, first-aid and CPR. First-year lifeguards earn a minimum of $13.57 per hour for a weekly salary of about $650. These vintage photos from the early 1900s show an all-male crew. It wasn’t until the women’s liberation movement of the 1960s that the Parks Department waived height and weight requirements and recruited its first female lifeguards. Capt. Riley and lifeguards, Coney Island, N.Y.
One day in the not too distant future, the wooden Coney Island Boardwalk may exist only in recycled form, far away from the People’s Playground, in venues frequented mostly by the privileged classes. 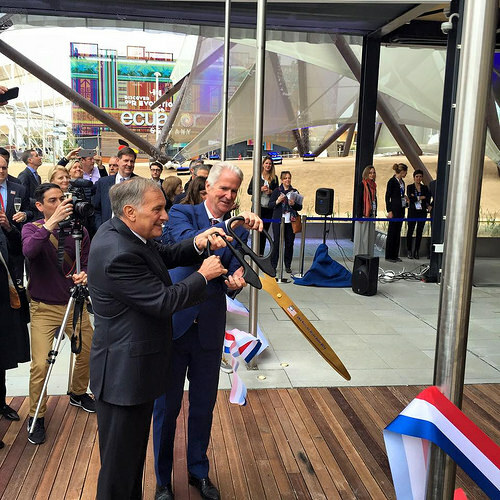 The May 1st opening of the Milan Expo provides a window into that future. 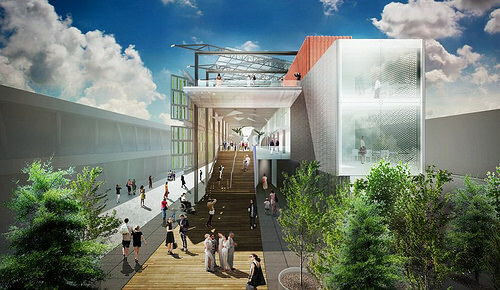 The Expo’s $60 million USA Pavilion boasts a 300-foot walkway said to be made of repurposed ipe wood from the Coney Island Boardwalk. Meanwhile, in Brooklyn, wooden sections of the Brighton Beach end of the Boardwalk are being torn up to be replaced with a walkway made of recycled plastic lumber and a 10-foot wide concrete “carriage lane” for so-called “emergency vehicles.” The $10 million pilot project is seen as the City’s plan for the future of the entire boardwalk, except for a few blocks in the amusement district that will continue to be made of ipe wood. And Coney Island’s heroic City Councilman Mark Treyger is trying to persuade the City’s Landmarks Commission that the Boardwalk should be declared a Scenic Landmark despite a previous rebuff. 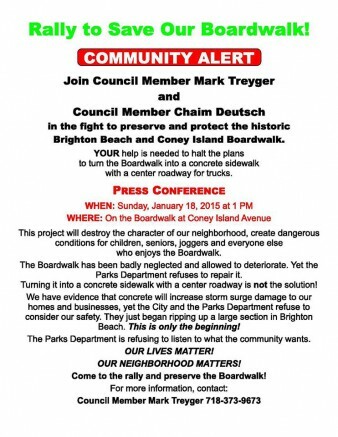 The Parks Department’s page about the Coney Island Boardwalk Reconstruction at Brighton Beach says “Replacing this portion of the boardwalk (Coney Island Avenue to Brighton 15th Street) using hardwoods could destroy some 6,000 acres of tropical rainforest, while 45,200 acres would be destroyed to reconstruct the entire boardwalk.” But instead of opting for a treated wood such as Kebony, which has been used at Delaware’s Bethany Beach Boardwalk (Parks claims Kebony is “only available in Europe”), or a wood over concrete substructure like Ocean City, Maryland, the City went for the cheapest and least aesthetically pleasing –a concrete and plastic surface. Parks Dept rendering of boardwalk reconstruction underway in Brighton Beach. 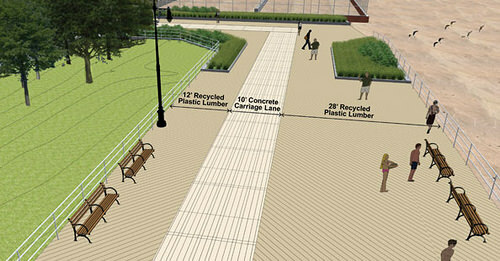 a 10-foot-wide concrete carriage lane will be included in the 50-foot-wide boardwalk. The Milan Expo project caught our eye a few months ago via a dramatically titled news story “Sandy-ravaged Coney Island boardwalk turned into showpiece.” Coney Island Boardwalk, the brand, commands attention, and rescuing discarded boards to make into something new and beautiful is commendable. 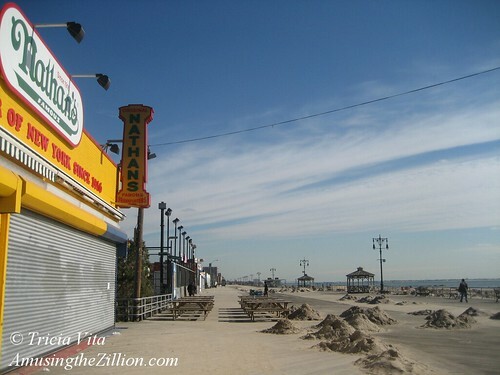 But in fact, the Coney Island Boardwalk was NOT ravaged by Sandy but survived intact, though the same can’t be said for the neighborhood or Steeplechase Pier. Berms built on the beach protected the boardwalk, which was inundated with sand that was shoveled into tidy piles and returned to the beach. 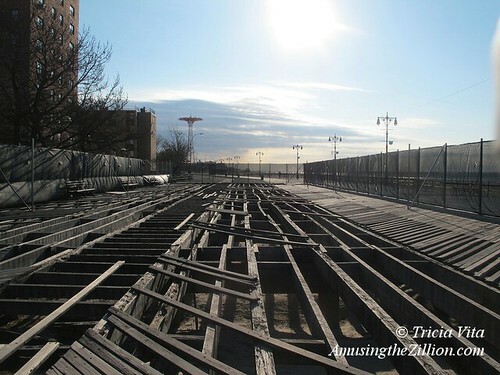 We’re not sure who started the ravaged boardwalk myth but it enables Parks’ claim that plastic lumber was more resilient than wood during Sandy, a fact disputed by actual residents of the neighborhood. The producers of luxury products made from Coney boardwalk wood, including such trinkets as a $195 knife with an ipe handle, unwittingly perpetrate the myth in their blurbs. In fact, the Parks Dept. 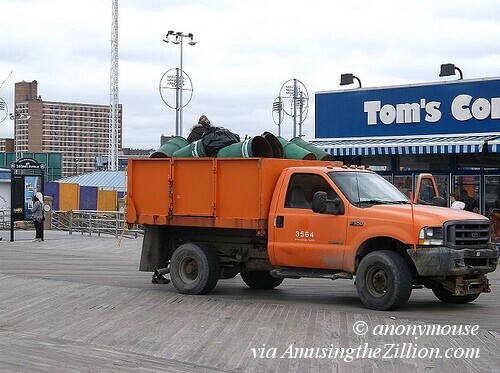 has been giving away and/or selling the wood for several years in the course of redoing sections of the boardwalk. The wood was torn up before the storm so that a new concrete surface could go down at Sea Gate and Brighton. Some boards are removed during regular maintenance and replaced with new ipe. There will be plenty more wood to go around now that they’re tearing up the boards in Brighton in a pilot project that was infamously approved by the Public Design Commission despite popular opposition. What the City of New York doesn’t want you to know, but anyone who lives or works along the boardwalk can tell you, is that the 2.51 mile pedestrian walkway is now routinely used as a roadway by Parks Department and NYPD vehicles, not just for emergencies. It is this everyday use which causes enormous wear and tear to the boards, which frequently pop up while whole sections cave in and have to be replaced. 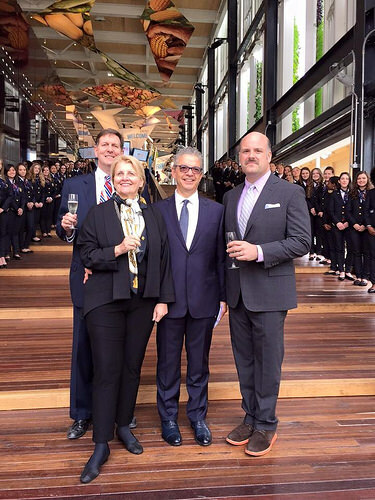 While repurposing discarded lumber is eco-friendly and gives a building a LEEDS rating, there’s something incongruous about sending this heavy wood more than 4,000 miles to Italy for an expo trumpeting sustainability. “Indoor and outdoor decking made of salvaged Coney Island boardwalk lumber will eventually be re cycled again,” according to the US Pavilion’s Sustainability Fact Sheet. Well, good, so Europeans can enjoy decks made from Coney boardwalk wood too. Or it will be shipped 4,000 miles back home. 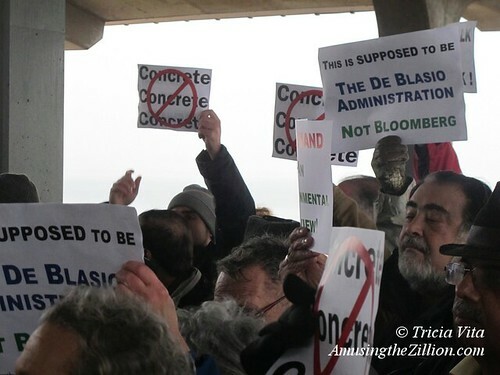 Despite icy conditions that made travel hazardous and a steady rain, about 100 people came out to Brighton Beach on Sunday for a rally to save the 92-year-old Boardwalk from becoming a concrete roadway flanked by a plasticwalk. There were many familiar faces in the crowd. Some of us had attended the charade of a public hearing where the pilot project was controversially approved by six Bloomberg appointees in 2012. The politicians joining the rally included Brooklyn Borough President Eric Adams, NYC Controller Scott Stringer, NYC Public Advocate Letitia James, and Councilman Mark Levine, who is Chair of the Council’s Parks Committee, among others. During the Bloomberg administration, when this concrete boondoggle was born, elected officials automatically fell in line with Bloomberg’s policies. The local Community Board 13 voted against this proposal 21 to 7, but their vote was ignored because it’s “advisory.” Now we have a newly elected crop of officials questioning Mayor de Blasio and Parks Commissioner Mitchell Silver for not listening to the community and going ahead with Bloomberg’s calamitous plan for the Boardwalk. Frustrated residents held up signs that said “This is SUPPOSED to be the DE BLASIO ADMINISTRATION not BLOOMBERG,” “This is NOT Planning, Commissioner Silver,” and “Mayor de Blasio & Commissioner Silver, We LIVE HERE.” Unfortunately the de Blasio administration has not changed the pro-concrete position announced last June by Daniel Zarrilli, who heads the Mayor’s Office of Recovery and Resiliency and is a holdover from the Bloomberg administration. Staten Island’s east shore, where Ferris wheels, coasters and carousels were awhirl in the early 20th century, has its first seaside park since South Beach’s Beachland Amusements closed after 65 years. 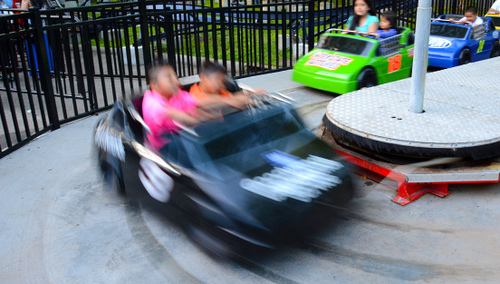 Fantasy Shore Amusement Park in Midland Beach opened last weekend for “preview days,” which continue on Thursday and Friday from 11am till 6pm. The grand opening and ribbon cutting is scheduled for June 28th. The new kiddie park opened with four rides: Tea Cups, Train, Frog Hopper and a mini-roller coaster christened the Verrazano Viper. Fantasy Shore is run by NY Carousel Entertainment, which answered the Parks Department’s RFP (Request for Proposals) to develop and operate a children’s amusement park for a 12-year term. The park is on Father Capodanno Blvd at Seaview Avenue, adjacent to Midland Beach Fishing Pier. Queens Motor Speedway Ride at Fantasy Forest Amusement Park. In January, NY Carousel Entertainment and Big Mark’s Action Park were among the amusement park operators eyeing Staten Island’s beachfronts when the City released a Request for Expressions of Interest (RFEI) that mentioned rides as well as carnivals and stall-based amusements. Last week, the Parks Department followed up by issuing an RFP (Request for Proposals) for the development and operation of a Children’s Amusement Park as well as the operation of mobile food units and souvenir carts in Midland Beach, with a 12-year term. Midland Beach’s 2.5-mile boardwalk and beach area extends southeast from Fort Wadsworth to Miller Field’s Gateway Recreational Area. The proposed site is located on Father Capodanno Blvd. between Seaview Ave. and Sand Lane, and includes concrete foundations for six rides. A diagram shows the pads occupied by a carousel, magic castle, sky glider, mini airport and spinning teacups circled by a trackless train, though these are just examples. There’s also a pad for a concession building with attached public restrooms, which are under construction. The RFP does not say when the park is expected to open, but a proposer meeting and site tour is set for March 28, with a due date for proposals of April 16th. To download the RFP, visit the Parks Department’s Concessions Opportunities page. Midland Beach, just south of South Beach, once had hotels, beer gardens, bathing pavilions, theaters, carousels, Ferris wheels and other amusements. Vintage postcards in the New York Public Library show a variety of entertainments, including trapeze performances, boxing exhibitions and a Whip ride. 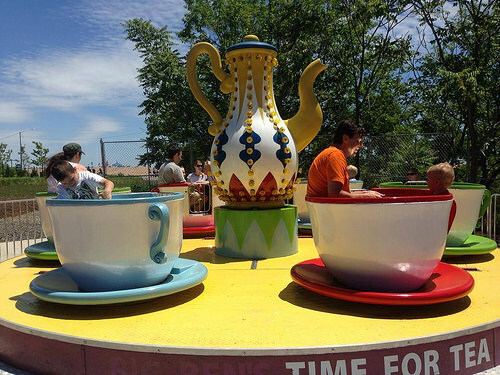 Fantasy Shore Amusement Park in Midland Beach opened on June 28th with four rides: Tea Cups, Train, Frog Hopper and a mini-roller coaster christened the Verrazano Viper. Fantasy Shore is run by NY Carousel Entertainment, which also operates Fantasy Forest Amusement Park at Flushing Meadows Park in Queens. World’s Fair Icons: Parachute Jump Saved, Why Not the NY State Pavilion? You cannot think of Coney Island without the Parachute Jump, especially now that it is illuminated nightly. Last night, it was bathed in sea green and blue light to celebrate the Seattle Seahawks Super Bowl win. But the iconic tower, which was moved to Coney after first thrilling visitors at the 1939-1940 New York World’s Fair in Queens, stopped operating as a ride after Steeplechase Park closed in 1964. The Jump endured nearly 40 years of neglect and threats of demolition before being rehabbed and lit with LEDs at a cost of $8.5 million during the Bloomberg administration. Beginning in 2002, the City’s Economic Development Corporation (NYCEDC) and Brooklyn Borough President Marty Markowitz championed the landmark’s costly revamp as part of their plan to revitalize Coney Island. Will the ruins of the New York State Pavilion, an iconic structure from the 1964 New York World’s Fair in Queens’ Flushing Meadows Park, which the Parks Department says would cost $14 million to demolish and $52 million to restore, find a plan and a champion to underwrite the cost of saving it? The voice is that of Frank Sanchis, director of the World Monuments Fund, which included architect Philip Johnson’s pavilion on their 2008 Watch List. The Tent of Tomorrow is in imminent danger of collapse due to the deterioration of the exposed steel structure and the decay of the wood piles that serve as the building’s foundation, according to WMF, which successfully nominated the Pavilion for inclusion in the State Register of Historic Places in 2009. Now as the building approaches its 50th anniversary, it’s in the spotlight again after years of neglect. People for the Pavilion, a grassroots group dedicated to the preservation and reuse of the structure, hosted a kickoff event last month which drew over 200 people. Silva, who is one of the organization’s co-founders, launched a Kickstarter for his documentary about the pavilion, and raised more than $11,000 towards his goal of $30,000 in the first week. The Parks Department held two “listening sessions,” where people were invited to share their vision for the future of the Pavilion after listening to a presentation on recent structural studies that were completed on the Tent of Tomorrow and Towers. The Parks Department has posted links to their PowerPoint presentation, which was shown at the listening sessions, and a survey “in order to understand your vision for the future of the New York State Pavilion.” The survey will be posted on the webpage of Flushing Meadows Corona Park through March 15.